These little seeds pack a big nutritional punch. 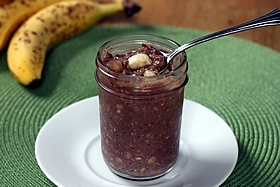 Great in oatmeal and smoothies. 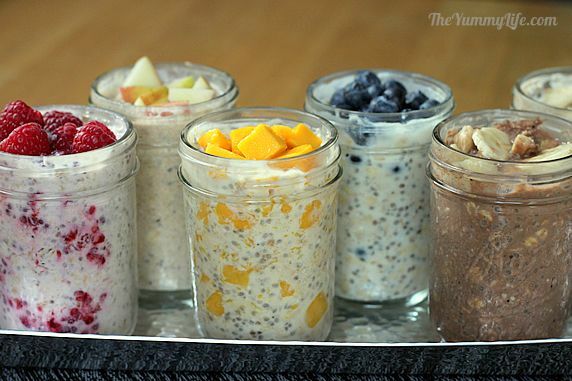 These are the perfect serving size for storing oatmeal in the fridge. These are long lasting and easy to screw on and off. 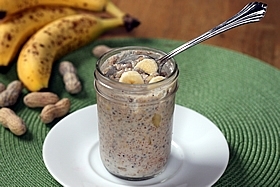 Get all of the flavor and protein of peanut butter with 85% less fat. Love this stuff! Bob's Red Mill is my favorite brand of oats. 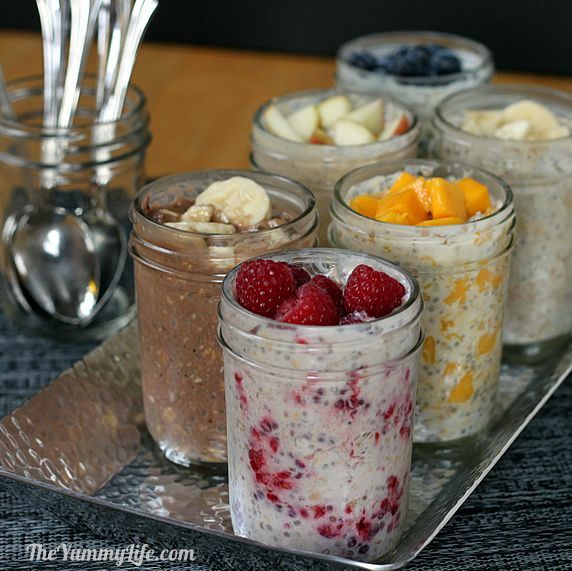 If you eat a lot of oats, this is a good place to stock up. 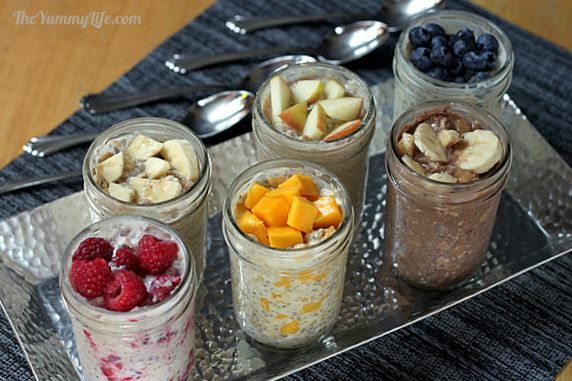 A healthy breakfast made in mason jars in six different flavors! This easy, no-cook "summer porridge" has make-ahead convenience and is packed with nutrition to get your day off to a healthy start. 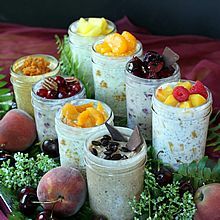 Make it in individual mason jars for a perfect serving size and an easy grab-and-go breakfast straight from the fridge (it's eaten cold). Take it along to work or anywhere. Great to serve on a breakfast or brunch buffet. High in protein, calcium & fiber; low in fat & sugar. Apparently this kind of cold yogurt & oatmeal mixture has been around for awhile. 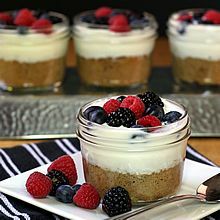 I don't know where I've been, because I'd never heard of it until I saw a recipe on Pinterest by Christie at PepperLynn.com. (Sorry, her website is no longer available.) We eat a lot of steel-cut oatmeal in the winter months, but it never appeals to me once the weather heats up. 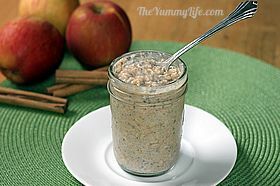 Learning about refrigerator oatmeal excited me, because it offers a way to enjoy oatmeal year round. 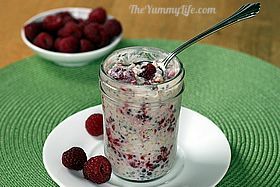 Yummy reader, Kelly, called this "Summer Porridge" in a comment on my Facebook page--I'd never heard of that either. 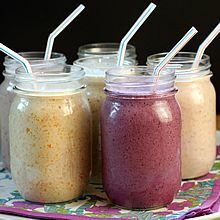 After some googling, I discovered that refrigerator oatmeal, yogurt oats, and summer porridge are all names for the same thing. Whatever you call it, this stuff is delicious! I played around with some different flavor combos, and created single portion recipes that will fit in a half-pint mason jar. I've been pulling these out of my fridge and eating them for breakfast all week. LOVE the convenience of having them made ahead. They are filling and packed with nutrition, too. 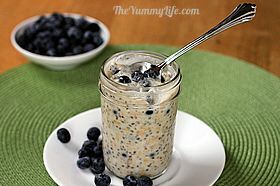 In addition to chia seeds, this refrigerator oatmeal has protein- & calcium-packed yogurt and fiber-rich oats. It's hard to find a healthier breakfast than this. 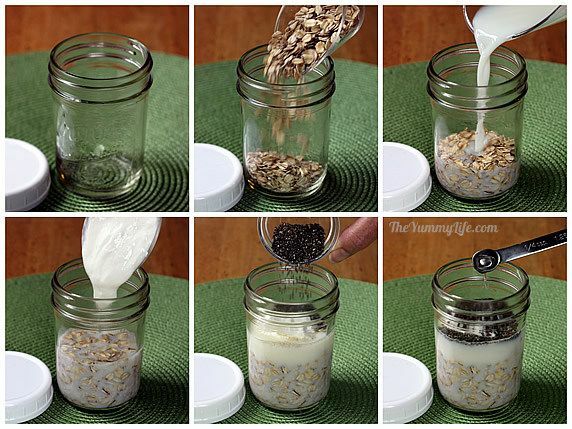 First, I'll show you the basic procedure for making refrigerator oatmeal. 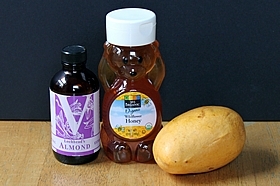 (All 6 recipes follow the same basic formula.) Then, I'll share ingredients, nutritional information and tips for the 6 specific recipe flavors. 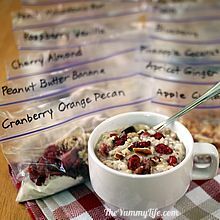 Specific amounts of ingredients are listed with the individual recipes for each of the 6 varieties of flavored refrigerator oatmeal ; they are further down in this post. Click on the big teal bar below each flavor and that links to the recipe with detailed ingredients and instructions. Step 2. 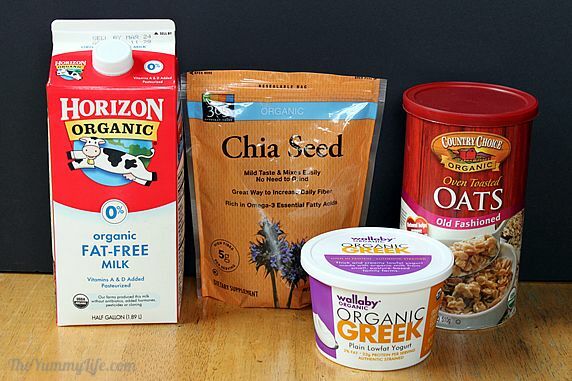 Add oats, milk, yogurt, and chia seeds to jar, along with desired sweeteners or flavors (see options below). Step 3. 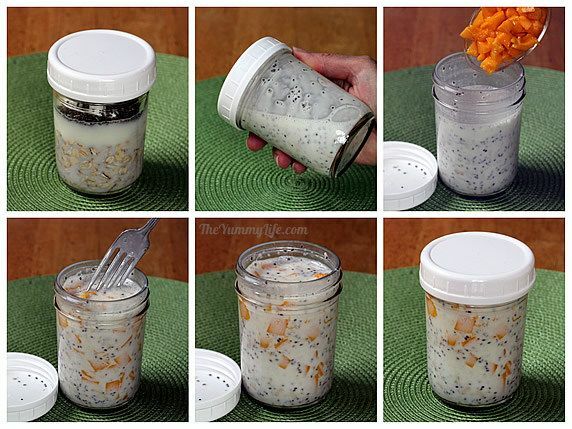 Put a lid on the jar and shake to combine. I use white plastic jar lids sized to fit canning jars--they last longer than the metal tops and rims that come with the jars, and they are easier to screw on and off; some Walmarts carry them, and they're available on Amazon. Step 4. Add fruit and stir gently until combined. Step 5. Place in fridge overnight and up to 2 days; maybe longer depending on the type and ripeness of the fruit. The non-banana varieties have been good after 4 days for me. 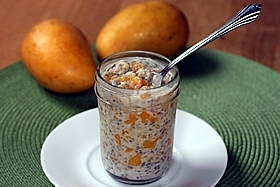 During the overnight soak, the oats and chia seeds absorb the liquid and soften. They have a great eating texture by the next day. Here are my six favorite flavor varieties. 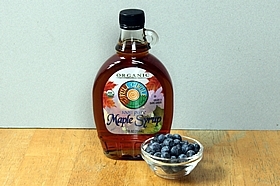 Flavored with fresh blueberries and maple syrup. 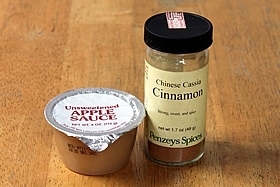 Flavored with unsweetened applesauce, cinnamon and honey. 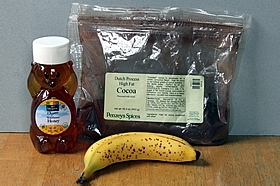 Flavored with bananas, cocoa powder, and honey. 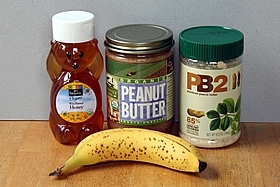 Flavored with bananas, peanut butter (or PB2), and honey. What is PB2? I recently discovered this amazing powdered peanut butter. It's simply peanut butter with 85% of the fat removed. With all of the flavor and protein of regular peanut butter, PB2 is recommended as a great way to reduce calories in all of your favorite peanut butter recipes. My local grocery story carries it. You can also find it at some Whole Foods, health food stores, and on Amazon. 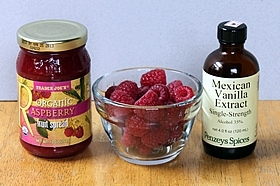 Flavored with fresh raspberries, raspberry preserves or spread (I used a no-sugar added fruit spread), and vanilla extract. Honestly, if you asked me to pick a favorite flavor, I couldn't choose just one. 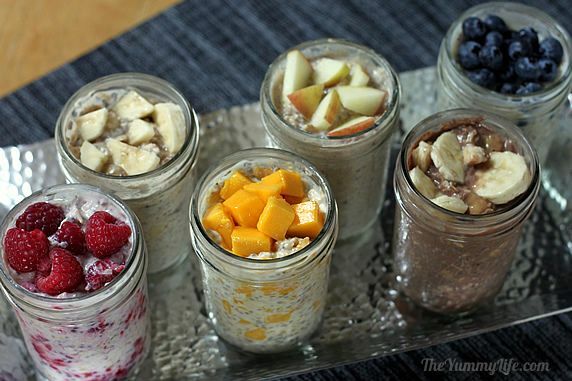 I've enjoyed having a variety of these jars in my fridge for an easy, yummy, nutritious breakfast each day. These would be fun to serve on a breakfast or brunch buffet. Garnish the tops with some additional fresh fruit to help identify the flavor and make a prettier presentation. 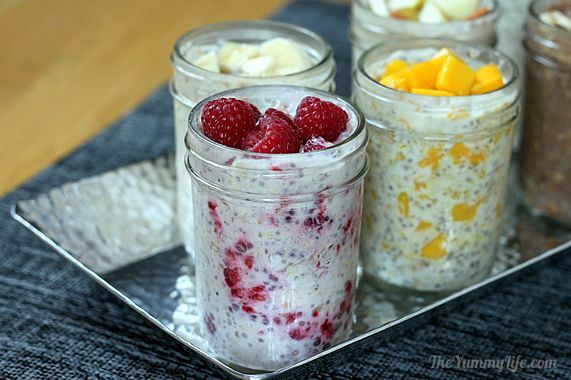 This marriage of yogurt, oats, chia seeds and fruit is my new favorite breakfast. The hard part is choosing just one flavor per day. Which one looks good to you?